Online store, eCommerce marketing, online payments, shipping, returns, integration and customer service are all essential ingredients for running a successful eCommerce business, but Online Payments holds a special place for obvious reasons. With increasing popularity of eCommerce, most businesses take orders and accept payments online. But accepting payments online does not directly transfer to money in the bank; the traditional process is – accept orders, authorize payment, order fulfillment (packing and shipping) and then capture payment. For most businesses accepting orders and payment authorization & capture happens in their eCommerce store and the rest in their backend ERP system. This requires businesses to manually sync information between the two systems on a number of occasions which is highly prone to errors. For businesses taking orders directly in their ERP system, payments are authorized and captured using an independent payment processor. The payment information is then manually entered into the ERP system which again is prone to errors. In this blog we will explore why ChargeLogic must be integrated with Microsoft Dynamics NAV and Magento eCommerce to streamline the payment processing while minimizing errors. But before we get there let us briefly explore what each one of these platforms do. Magento is currently the most adopted and feature rich eCommerce platform with more than 200,000 merchants selling online through Magento. Magento is owned by eBay, the online eCommerce powerhouse. Microsoft Dynamics NAV is the most widely used Dynamics ERP platform with over 110,000 companies using the tool to manage all their business critical operations. 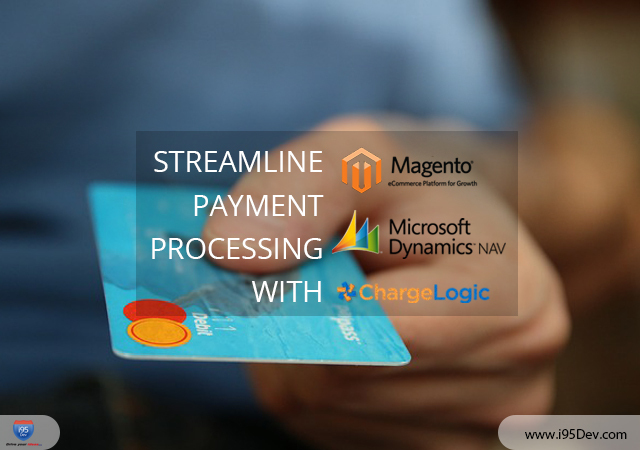 ChargeLogic Payments is a PCI-validated credit card and payment processing solution for Microsoft Dynamics NAV. ChargeLogic is completely integrated with Microsoft Dynamics NAV and directly connects with all the major payment processors in the United States and Canada, giving customers a smooth, reliable transaction with every purchase. With ChargeLogic Payments, charges are automatically settled when sales orders are shipped or when a retail sale is completed. For Microsoft Dynamics NAV customers who sell on eCommerce, ChargeLogic offers a PCI-certified payment gateway called ChargeLogic Connect, which not only offers a better way to integrate ChargeLogic with eCommerce solutions but also seamlessly integrates with Dynamics NAV. ChargeLogic Payments in Microsoft Dynamics NAV enables businesses to take orders and accept payments directly from their Dynamics NAV systems. This not only streamlines the accounting information but also minimizes the security risks associated with payments processing. Processing payments directly in Microsoft Dynamics NAV also minimizes the payment cycle by capturing payments directly from their Microsoft Dynamics NAV soon after order fulfillment. With ChargeLogic Connect businesses can take their Magento eCommerce store to be PCI compliant (a time and resource consuming process for most businesses). ChargeLogic Connect provides the option to use a hosted payment page or hosted payment window for customers to make eCommerce payments and have the data tokenized before flowing into NAV. The integration streamlines order processing by authorizing payments in Magento during order placement and then directly capturing payment from Dynamics NAV on order fulfillment. It further eliminates the need for businesses to settle payments via external gateways by enabling settlement directly with the payment processor. This reduces the possibility for duplicate transactions, incorrect amounts, etc. This entire process can further be streamlined with i95Dev’s Magento and Dynamics NAV Connect. The Magento and Dynamics NAV integration eliminates the need to manually transfer orders and related information between the two systems and has a number of other advantages to offer. 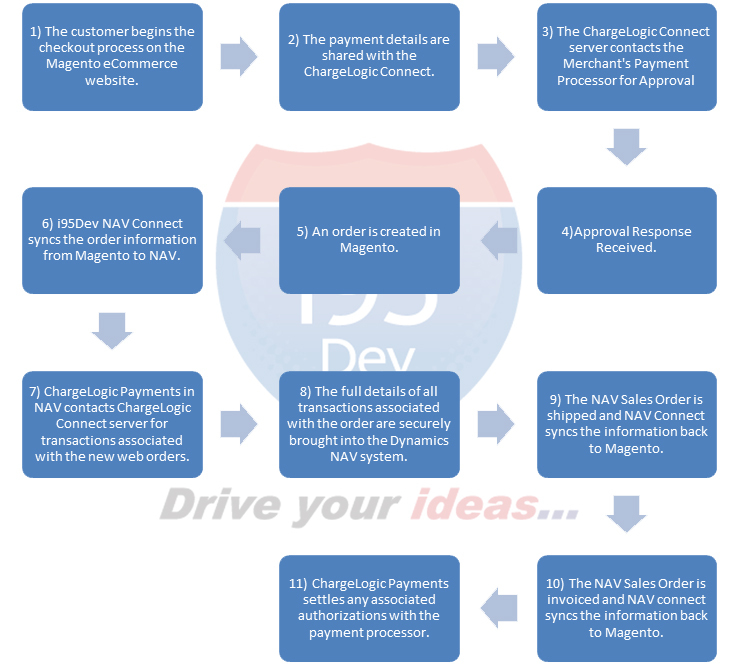 i95Dev can seamlessly connect Magento with Dynamics NAV and also integrate Magento with ChargeLogic streamlining your entire order process.